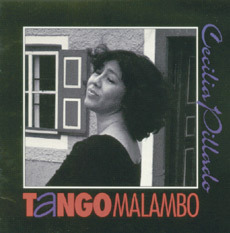 CECILIA VERÓNICA PILLADO, the charismatic Italoargentinian pianist, was born in Mendoza, Argentina. She is one of the first Argentinean pianists to give the music of her country a central place in her performing repertoire: her two CDs Argentine Piano Music I and II, feature representative works by well-known Argentinean composers as Ginastera and Piazzolla, and the outstanding arrangements of popular Tangos bear testimony to this. She graduated with honours from the National University of Cuyo in her home city. With a scholarship from the Friedrich-Naumann Foundation she continued advanced studies at the University of Arts Berlin and at the “Mozarteum” in Salzburg. She also participated in master courses directed by Franz Leygraf, György Sebök, Leon Fleisher, Maria Curcio, and Paul Badura-Skoda, studied Composition, and completed her classical preparation with Jazz Improvisation seminars. She has won a number of prizes and awards — among others the “Teresa Carreño OAS Award” in Venezuela, and has performed in the United States, Europe, South America and Asia at renowned concert halls like the Philharmonie and Konzerthaus in Berlin, Teatro Colón in Buenos Aires, Sala Verdi Milano, Teatro Comunale Bologna, OAS Hall at the Kennedy Center, Washington D.C. Her incessant exploration of all facets of the Performing Arts has led her into the realm of acting. As an actress she participated in independent theatre groups, and played parts in German television series and films. 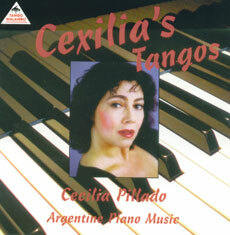 An interesting selection of traditional, popular tangos from the Argentinian fatherland, in brilliant and virtuosic arrangements by the pianist. […] Ms. Pillado’s tango arrangements are – like her original compositions – the work of an artist for whom the piano has no secrets. The instrument’s possibilities are fully used to underline the different character of each tango. Once in a while the listener is reminded of Ms. Pillado’s training as a Classical pianist, as echoes of Chopin, Tchaikovsky or Rachmaninoff – not least the eye-twinkling quotation of Für Elise at the end of Taquito militar – are heard within the texture of the piano part. "These Tangos are dedicated to my mother. She always had the text of some tango on the tip of her tongue to comment on everyday situations. A spoken word was enough for her to start singing a tango verse reflecting a deep popular wisdom and particular philosophy of life. She was my link to the tango. But another “mother” also appears at times in my mind in the form of luminous images: the natural surroundings in the Argentine Pampas, the open countryside, where we would ride horses and play to our heart’s content. All of these feelings and nostalgic but powerful memories flow into the music of this CD. That’s why it is my personal favourite". This CD presents a broad spectrum of Argentinian piano music from this century, represented by most well-known composers of the country, Ramirez, Ginastera, Guastavino and Piazzolla, followed by Pillado’s own composition “Malambo-percu-piano”. In this piece, the pianist drums the beat on the closed lid of the piano before she begins to play. […] The five featured composers have one thing in common, namely that all of them have turned to Argentinian folk music for their inspiration. The results, however, could not be more different. […] Ariel Ramirez uses technical means from European classical music to create pieces which are closely based upon rhythmic and melodic models from Argentinian folklore. […] Ginastera’s development of rhythmic elements and his use of polytonality give his music a “contemporary” flavour that has led to his being thought of as a “South American Bartók”. […] Piazzolla has created an unmistakeable style which unites tango with elements of jazz and classical music. […] Although Carlos Guastavino is just two years older than Ginastera, his naively lyrical music is more in accordance with the ideals of the previous generation of composers. […] The Malambo begins by using the piano as a percussion instrument before starting improvisations on the three notes which constitute the “guitar” cadence. 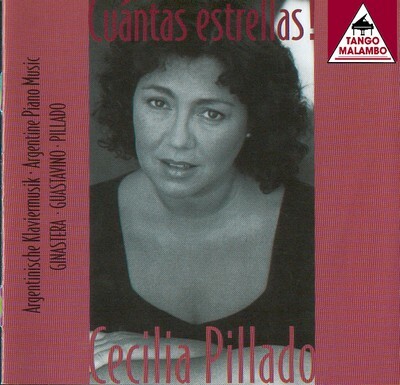 …Cecilia Pillado ist well known in Berlin’s professional circles as a musician of superior quality. … A CD full of musical stimulations and high pianistic art. Attractive and technically impeccable, “Tango Malambo” demonstrates not just Pillado’s talent, but also her professional level. … Pillado sees herself “as a musician first, and only then as a pianist”. Nevertheless, she exhibits an exquisite taste precisely at the keyboard, in all matters concerning colouring, pedalling and the production of a rounded tone. And yet her self-estimation is correct: the idiomatic and natural way in which she characterizes the different compositions in her recital of Argentinean music is conquering in the most charming way. 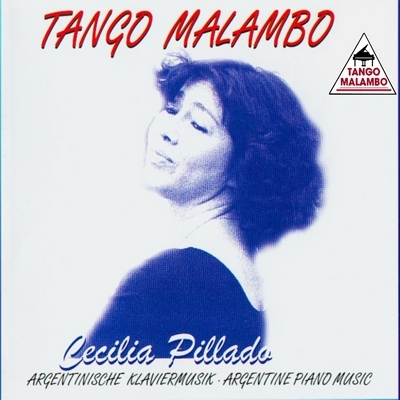 Reeleased after “Tango Malambo”, it confronts the technical demanding Ginastera’s first piano sonata, which was soon been played all over the world after been composed in 1952, with the Guastavino’s “Preludes on Argentinian Nursery Rhymes”, a master piece of the small genre and composed also in the same year. These pieces contrast with the “Amazones Variations”, Pillado’s composition inspired by esoteric philosophy. […] Ginastera’s Piano Sonata is a good example of what the composer termed “imaginary folklore”. His “expressive tension” has a stark Argentinian accent even though no direct quotations or echoes from folk music can be heard in it. […] The 10 Preludes by Guastavino could be described as a kind of Argentinian Scenes from Childhood. They are a further testimony to the composer’s mastery of the small genre piece. The “Amazones Variations” showcase the artist’s brilliant pianistic art, which expresses every facet of the sound and technical nuances. Rhythms, nothing but rhythms, but WHAT rhythms! Blindingly lit by Pillado’s piano playing … Her spontaneous virtuosity and her temperament seem to have no limitations … A recording between Classical music, Postmodernism and Jazz, presented by an electrifying pianist – the best!